The Burgess Hill Bike Ride Committee would like to thank all those who took part in or helped with the 26th Burgess Hill Bike Ride in June. This was in aid of Chailey Heritage Foundation’s D.R.E.A.M. Appeal and other local projects supported by the joint organisers, Burgess Hill District Lions Club and Burgess Hill and District Rotary Club. Almost 400 riders took part in the event and signed up for one of the 10, 25 or 40 mile routes. We were pleased to welcome back to this year’s event 180 riders who had taken part in the Ride before. Yet again we had a fine day for the event! The ride only took place thanks to the efforts of over sixty volunteers who marshalled the Bike Ride, registered entrants, manned water stops and generally looked after the whole event. In addition, many local firms, as usual, kindly provided water, chocolate bars and bananas for the riders. The Burgess Hill Bike Ride is very grateful to Sigma Partners, who again sponsored the T-shirts for this year. It took time for all the sponsorship and GiftAid to come in from all sources but the Bike Ride brought in a total of over £8,000 for all our charities, half of which will go to the D.R.E.A.M. Appeal. Many thanks for all who have ridden or helped! 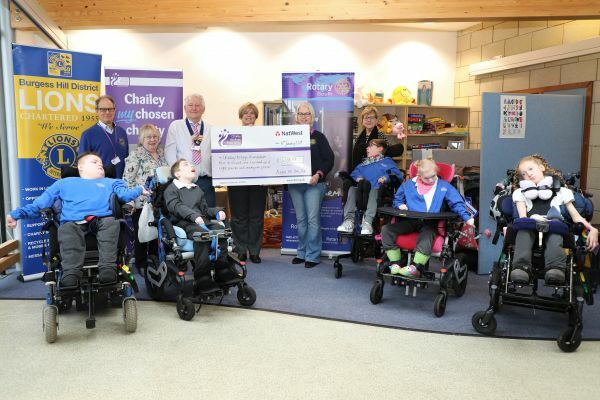 We had a presentation at Chailey Heritage School on 16th January 2019 and were pleased to hand over a cheque for £4,108.79. This was followed by a short tour and we were very impressed by all the care and work that takes place at the school to look after the children and young people. Another £4,108 will be split between Rotary and Lions Clubs for their local charitable projects. The main beneficiary of our 25th Burgess Hill Bike Ride was St Peter & St James Hospice: other local charitable projects will be supported via the Lions and Rotary Clubs. The event started and finished at The Burgess Hill Academy (formerly Oakmeeds School) and we were fortunate to have a fine day for cycling - not too hot! Almost 400 riders took part in the event and signed up for one of the 10, 20 or 40 mile routes. We had Burgess Hill Community Radio at the start to assist us with announcements and also interview riders both at the Start and when they returned. The ride only takes place thanks to the efforts of over sixty volunteers who marshall the Bike Ride, register entrants, man water stops and generally look after the whole event. In addition, many local firms, as usual, kindly provided water, chocolate bars and bananas for the riders. This year we were very grateful to Sigma Partners, who sponsored the T-shirts on our 25th Anniversary. These were given free to all entrants. 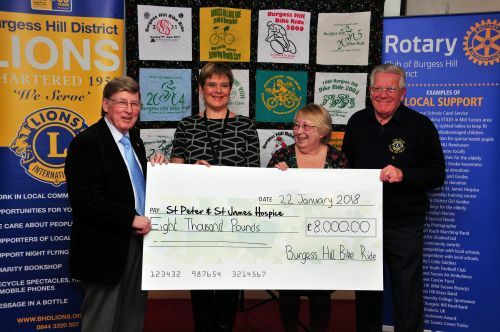 Because of this we were able to raise a total of over £8,000, half of which went to St Peter & St James Hospice and the remainder to other local charitable projects supported by the joint organisers, Burgess Hill District Lions and Burgess Hill and District Rotary Club. Due to the Big Give project, sponsored by the Government for a short time in early December, we were able to double the money given to St Peter & St James Hospice to £8,000, as they had a Dementia project that was supported by the Big Give. This had a budget of £40,000 and they had raised £47,000 by the end of the qualifying period. So in essence, the Bike Ride had raised over £12,000 for charity! We had a presentation to St Peter & St James Hospice on 22nd January 2018. The picture shows Rotarian Brian Lewis, Community Fundraiser Wendy Agate, Lion Terri Stephens and Lion President John Carter. The 24th Burgess Hill Bike Ride took place in glorious sunshine (again!). With approximately 400 participants and an army of helpers and marshals, the ride ran smoothly with individuals, families and cycling clubs undertaking 10, 20 or the more challenging 40 mile route around Mid Sussex. Earlier this year founder Member and Chair of the Bike Ride, Malcolm Stephens, died suddenly and all involved with the ride were very keen that the ride should continue with its usual high standard of organisation. This was achieved and thanks are also due to the many sponsors who, through their support, helped raise approximately £6000 for the Sussex Cancer Fund and other local charitable projects supported by the joint organisers, Burgess Hill District Lions and Burgess Hill and District Rotary Club. A cheque presentation to the Sussex Cancer Fund took place in March 2017. The proceeds of the 2016 Ride were £6,524.34, with £3,268 going to Sussex Cancer Fund and £1,628 each to Burgess Hill District Lions Club and Burgess Hill and District Rotary Club. Pictured are Dr George Deutsch from Sussex Cancer Fund with Lion President Sarah Dorrington and Rotary President Jenny Theobald. 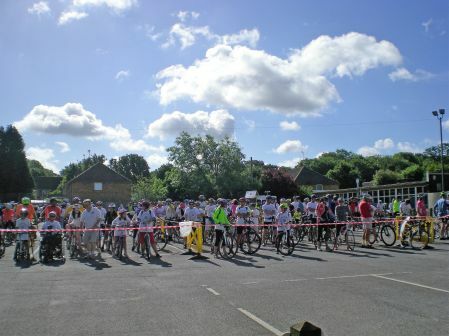 Hundreds of cyclists set out on a gloriously sunny Sussex Sunday on the 23rd Burgess Hill Bike Ride on 7th June. The event - organised by local Lions and Rotary Clubs - raised thousands of pounds for the Sussex Heart Charity and also smaller local good causes selected by the clubs. "The Burgess Hill Bike Ride is an event for charities run by charities" said chairman Malcolm Stephens "and all our profits go to charities. It's also a fun day out for our cyclists. We hope to attract first timers every year but are also happy to welcome back regulars such as the Sussex Nomads." Many entrants later reported how much they had enjoyed the routes (mainly through East Sussex this year) which had been hand-picked by local experts. They also complemented our volunteer marshals and our easy to follow signs. "We would like to thank not only our club members and volunteers who make the event possible", added Malcolm, "but also our many sponsors - Tesco (chocolate bars), Budgens (bananas), South Downs Nurseries (bottled water), the Print House Group for graphics, T-shirts and posters and Bennett Christmas Insurers (printing). Our Bike Doctor was provided by Proper Coffee and Cycling from Hassocks and wrist bands by Places for People. Entrants were followed round the route by a SERV motorcyclist and venues were generously provided by Oakmeeds Community College, Chailey School and the Half Moon at Plumpton. Support was also given by Burgess Hill Town Council." It was a grand day out! The first pay-out of proceeds from the 2015 Burgess Hill Bike Ride took place on 6th December 2015 at the Mid Sussex Golf Club. Terry Ayres from the Sussex Heart Charity was presented with a cheque for £3,394. Cheques of £1,697 were presented to Lion President Christine Coxshaw and Rotarian President Jenny Theobald to be distributed to their local good causes. The photo shows (from left): Jenny Theobald (Rotarian President), Terry Ayres (Sussex Heart Charity) and Christine Coxshaw (Lions President). A huge thank-you and congratulations to everyone who took part for making the 22nd Burgess Hill Bike Ride in 2014 a resounding success! This year proved a red-hot favourite for those entering on the day and as the sun shone down on Burgess Hill, a total of over 500 cyclists set off around the 10, 20 and 40 mile routes. It is wonderful to see this annual event become so popular with local cyclists and many from further afield and it was great to be there at the finish to hear the comments of the riders praising the organisation, the routes and the marshals. In the past, Round Table and Lions Club put in a tremendous amount of effort throughout the year into organise the event but on the day an even wider team turns out to support the event and ensure everything goes smoothly. In 2014 for the first time the event was jointly organised by Burgess Hill District Lions Club and the Rotary Club of Burgess Hill and District. The main beneficiary of the event was the Kent, Surrey and Sussex Air Ambulance. South Downs Nurseries provided a welcome stop on all routes, Wickwoods Country Club had a water stop for 20 milers and 40 milers could take a break at the Half Moon, Plumpton. Our famous collectible T-shirts came courtesy of the Print House. Also behind the scenes this year, all our printing is being produced by Bennett Christmas Insurance Brokers and, of course, Oakmeeds Community College gives us the venue for our Start and Finish. Burgess Hill Bike Ride Chairman Malcolm Stephens commented: "As Chairman of the organising committee I am privileged to receive feedback from organisers, supporters and cyclists. This year I hope to have people tell me that they are still proud to be a part of such a superb event. Close to £7,000 was raised but that is only part of the story. 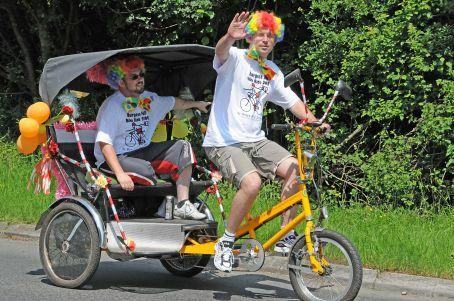 This is a marvellous community event that provides pleasure to hundreds of people each year and you should all - sponsors, other supporters, marshals and cyclists - be really proud of your contribution to it." The main beneficiary of this Bike Ride was for many years the St Peter and St James Hospice which is very well supported by many in the area. 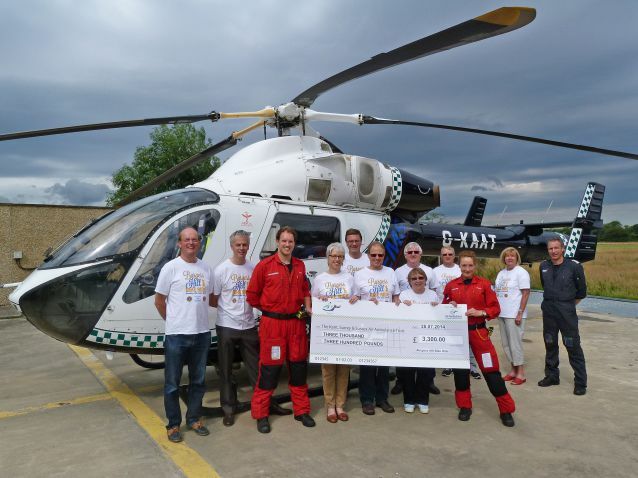 In 2014 we decided to support the Kent, Surrey and Sussex Air Ambulance Appeal. The following photograph shows the presentation of the cheque for £3,300 to the appeal. Directly after this photograph there was a 'shout' and the helicopter flew off to help yet another person. 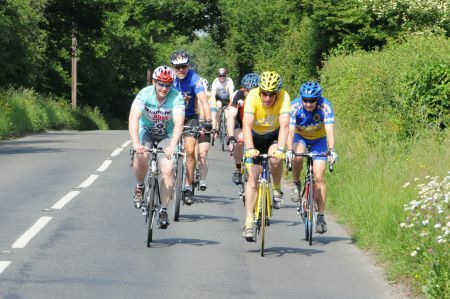 The Burgess Hill Bike Ride was devised by Lion Malcolm Stephens as long ago as 1992, with the first event held in 1993. Since then it has raised well over £100,000 for many charities including Barnardos, Knowles Tooth and Chailey Heritage, as well as St Peter and St James Hospice. Most rides had a different T-shirt and Malcolm's wife, Terri, turned them into an eye-catching quilt to mark the 20th annual event. "The Bike Ride used the same T-shirt design for the first five years" said Terri, "and entrants were given year-dated badges to mark the event. The first dated T shirt was in 1998. That's why there are 16 designs in the quilt."